New selection method with two gridviews and wider dialog. Advanced filename with unlimited possibilities, including sheet and project parameters. 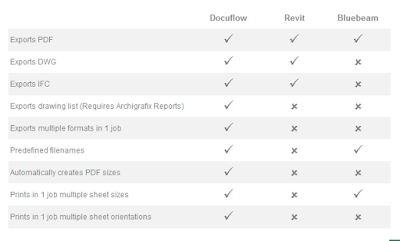 Support to sets of Revit sheets for quicker selection. Publishing of sheets to a single PDF is now supported, including the possibility of reordering the sheet sequence beforehand. Checks Revit build number and prevents Docuflow to run with Revit builds that crash when printing to PDF. Bypasses installing the printer drivers if they are already installed. Autofit of text in the sheet selection to make all text visible. New control to show/hide columns in the sheet selection in the tab Customize. Display error if the user has no permissions to use the PDF printer. Prevents Docuflow beings installed if Revit is runnning to ensure correct behaviour. Comparison of features with other software. without the need to install a local license server. The trial is fully functional for 7 days. 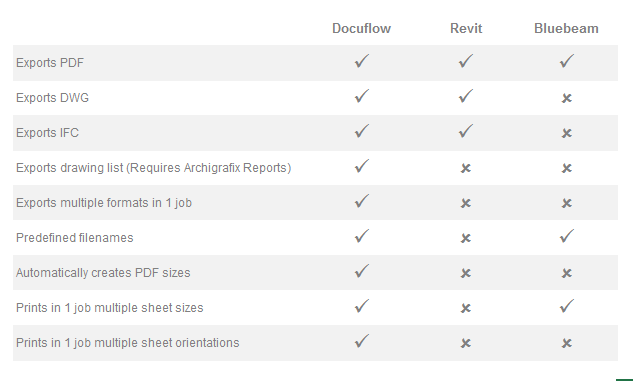 Docuflow is brought to you by archigrafix. Pricing starts at US $29.90/year.